About Aphrodisiacs - Boost your sexual technique and health. Viacreme: More Sexual Enjoyment for WOMEN. Different animal foods can exhibit different aphrodisiac properties. Aphrodisiaces can orignate for ocean animal species; fish or shellfish. Oysters spring to mind as having a BIG aphrodisiac reputation. Equally aphrodisiacs can eventuate from certain land animal species which have that aphrodisiac reputation, bulls to name but one. Animal parts are also play a big role in Traditional Chinese Medicine where the reproductive organs of various animals are widely used as aphrodisiacs. 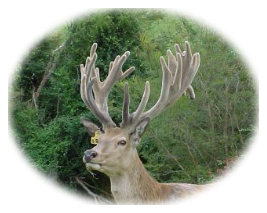 One such animal that is recognised for its aphrodisiac properties is the stag, with it antlers symbolising verility and fertility. We do not promote the use of wild and endangered species for use as aphrodisiacs. People should use only products from animals that are farmed in a sustainable and managed way, fully recognising the welfare of the animal concerned. This site is for your enjoyment, education and entertainment. About Aphrodisiacs takes no responsibility for the efficacy or use of the claims and products suggested here. About Aphrodisiacs can be contacted through John Ryan, Wellington, New Zealand or email john@aboutaphrodisiacs.org. © Aboutaphrodisiacs 2001.